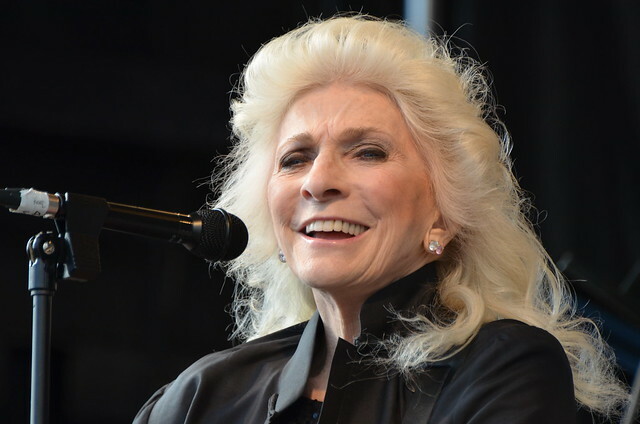 Posted on 12/20/2018 by Mark Engleson	in Live Review and tagged Americana, folk, Judy Collins, New York City, The Birchmere. At 38, I’m not typical of the audience here at The Birchmere on a Tuesday night for a Judy Collins concert; the friend I’ve brought to the show is a bit closer at 52. As Judy said, said “I’ve been doing this for 59 years.” “You’re looking at the American Idol of 1957,” she joked. I grew up on my parents’ records, though. Well, my mother’s records — my father had exactly two albums, by Gordon Lightfoot and Iron Butterfly. My mom had a bunch of folk and Motown records. I grew up on this stuff. Judy is best known as an interpreter of songs, rather than as an original songwriter. She first brought the songs of Joni Mitchell and Leonard Cohen to the world’s attention. Leonard would later ask Judy why she didn’t write her own songs, so she did. Judy related her first encounter with Joni Mitchell. She was home asleep when the phone rang at 3am, waking her up. On the line was Al Kooper, who played Hammond organ on “Like a Rolling Stone” and brought together Blood, Sweat, and Tears, and he had something she had to hear. Al put Joni on the line, and she sang “Both Sides Now.” “Both Sides Now,” one of two of Joni’s songs Judy shared, along with “Chelsea Morning,” became Judy’s first big hit. After she opened her set with “Chelsea Morning,” Judy was quick to bring up the subject of Stephen Stills, of the legendary trio Crosby, Stills, & Nash. Judy and Stephen had an a passionate but all-too-brief romance in the late ’60s. Judy served as a muse to Stephen, who wrote some of the most beautiful songs in the pop canon about her, including “Suite: Judy Blue Eyes” and “Helplessly Hoping,” the latter of which Judy sang for the audience. Judy’s set also included traditional folk songs. Noting her Irish heritage, she sang “Danny Boy” a capella. She told the audience how she learned “Fair Young Maiden” from a character called Lingo the Drifter, a folk singer and radio host who would drink and talk with her father. Speaking of her father, it was after singing the Beatles’ “Norwegian Wood” that Judy spoke about how “I grew up in a dysfunctional family — it had more than one person in it.” In her memoir, Sweet Judy Blue Eyes, Judy writes about how her father overcame the challenge of being blind since early childhood. He was also, Judy writes, an alcoholic, something he passed on to her. She joked that she didn’t do many drugs in the ’60s because it would’ve interfered with her drinking. Judy’s father also passed on his love of music and his passion for politics. He worked as a radio host, and he would sing from the Great American Songbook, tell jokes, and even get away with presenting progressive political views. Judy participated in registering voters in the South. She has always recorded political material, like the poignant and highly topical “Dreamers” about immigrants. Judy’s songs were absolutely beautiful, and she commanded the stage with the presence of someone with decades of experience. Her jokes all landed, her stories entertained, and her audience left delighted. This was a veteran entertainer at her best.